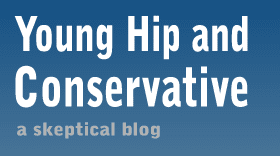 Young, Hip and Conservative: a skeptical blog: I'm going to ask you just one more time. And it's local? As silly as the locavore movement is sometimes, I do think that people get real economic value out of backstories. Look at it this way: what if I offered to give you a discount on your meal if I could, while you ate, explain the horrific factory farm conditions, etc. that brought it to your plate? It's also why I think some soft, voluntary "buy local"ism is OK: the extra paid to local merchants is in exchange for a sense of community and the release of (irrational) guilt. In pure economics terms, this has no value--everyone should shop online for everything as cheaply as possible--, but in the real world it's OK to pay to feel good sometimes.